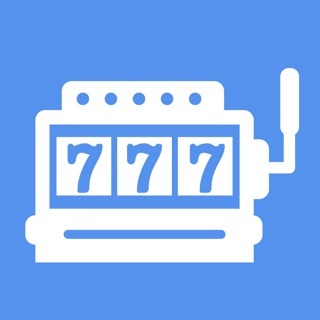 Jackpots Finder is your to-go app for everything related to finding online progressive jackpots. 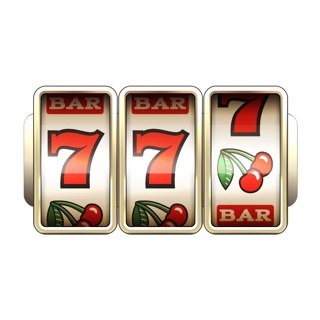 Using Jackpots Finder, you’ll be able to find, track and follow progressive jackpots from all tiers, themes and genres. Jackpots Finder’s data is based on real-time info from the progressive jackpots themselves, providing fresh data to users. With hundreds of progressive jackpots in the Jackpots Finder database, users can track their favorite progressive slots and get notifications when the jackpots are about to hit. 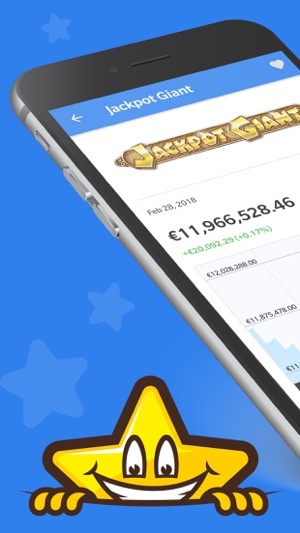 Relying on statistics, Jackpots Finder can give users predictions on when a jackpot will be hit and when is the best time to play it. 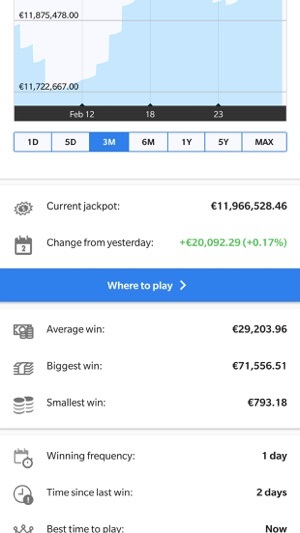 • Real-time Stats - Know about the latest wins and follow all changes in every jackpot, including changes from yesterday, biggest and average wins. 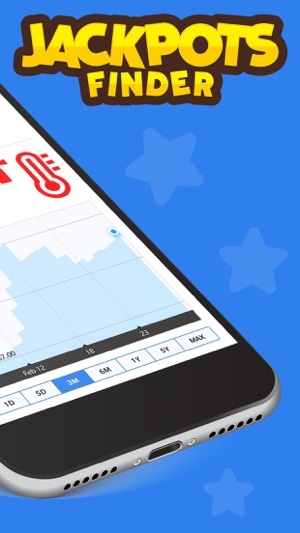 • Cold and Hot Jackpots - A unique jackpot thermometer will indicate which jackpots are cold, warm and boiling hot which gives you recommendations on when is the best time to play. • Follow Jackpots - Add your chosen progressive jackpots to a “favourites” list to get the drop on them and always remain updated. 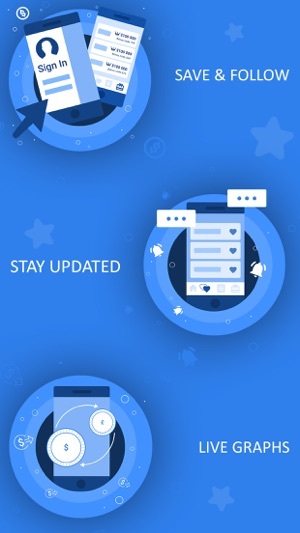 • Notifications - Get push notifications about the progressive jackpots of your choice to know when they are about to get hit or when they are won. • Jackpot Graphs - Use jackpot graphs to learn the history of wins on a specific jackpot was last hit and on what amount. • Overviews - Get the rundown on each progressive jackpot to know exactly what it’s about including type and theme. 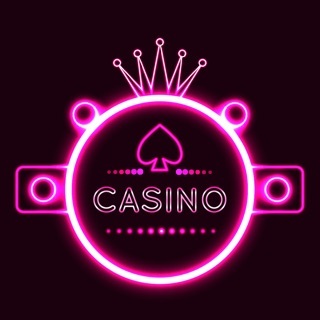 • Where to Play - Find trusted online casinos where you can play your desired progressive jackpot. 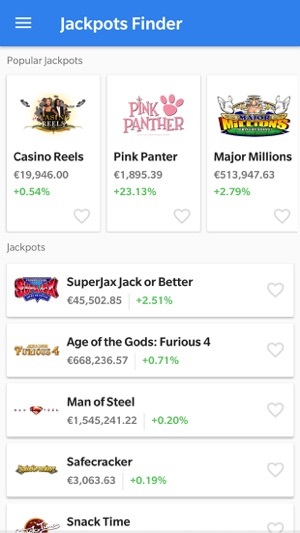 • Jackpot news - Read the latest progressive jackpot news from well-known online gambling sources of information including news portals and so on. • Easy to Use - Jackpots Finder is a breeze to use for beginners - simply launch and find your progressive jackpot. 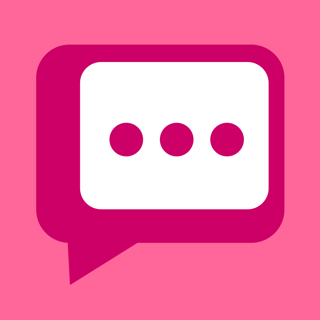 *By using this app you certify that you are over 18 years old and aware that gambling can be hazardous.